The Laurens County Landfill is a non-profit enterprise that provides disposal services for residents and businesses in Laurens County, Georgia. One of the most important services that it provides to the local community is disposing of the city of Dublin's biosolids, the solid waste that remains after the sewage treatment process. Every year the landfill receives thousands of tons of biosolids, and managing this volatile waste was a challenge. A common practice among landfills is to mix garbage with biosolids and then to compact this mass which reduces the volume of both the garbage and the biosolids, more than if each was compacted alone. But for the compaction process to work, it requires the proper ratio of biosolids to garbage. This was the problem facing Michael Snipes, director of Solid Waste Management for the Laurens County Landfill. The biosolids did not arrive in regular delivery intervals, and rarely in the proper ratio for compaction. “You just never knew what to expect. You might go for weeks or months without getting anything, and then all of a sudden you would be inundated with biosolids.” Snipes said, adding that on some days they might receive anywhere between 40 to 100 tons of biosolids. Too many biosolids meant that there might not be enough garbage available to mix for compaction. And too few biosolids meant that they couldn't be compacted. Both situations wasted space in the landfill, and caused a management headache, as well as racking up costs. To Snipes composting, the process of using microorganisms to break down organic matter, seemed like a natural choice for the Lauren's County landfill. It would give him a way to respond to the variable-sized loads of biosolids as they came in, and the composting process would turn the biosolids into a stabilized, rich, soil-like substance that could then be applied on agricultural fields as a fertilizer. Also, diverting this waste would conserve thousands of cubic yards of “air space” in the landfill every year, prolonging the life of the landfill and saving the operation thousands of dollars. The logistics worked in Snipes's favor. He had access to a large, dependable supply of yard waste to mix with the incoming biosolids to achieve the proper carbon to nitrogen ratio, which is essential to stabilizing the ammonia in the volatile biosolids and manage odor problems. Another benefit to composting is that Snipes did not have to worry about accumulating too much end product. If he couldn't sell it, the compost could be stockpiled to use as erosion control and as cover in the landfill. “If we couldn't sell it we still have a use for it, and we had plenty of room to store it, so it was not an issue for me. It (composting) increased or improved our operation significantly and at the end of the day we had a use for it, so it was just a win-win for our facility,” he said. 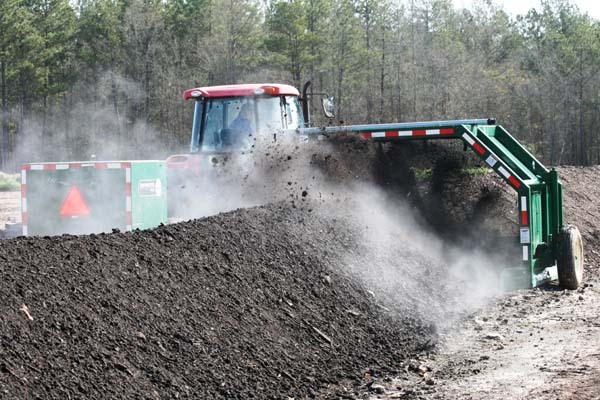 After becoming certified as a “composting operations manager” through the Solid Waste Association of North America (SWANA ) Snipes made his first batch of compost in 2008 using a front-end loader to turn the windrows. His first efforts were a success, allowing him to divert thousands of tons of biosolids from the landfill. And he began to think about ways to add new waste streams to the program. Animals mortalities became his next focus. The mortalities composting has expanded each year, and it now includes county road kill and agricultural mortalities, giving local farmers and the county government a way to dispose of their animal mortalities. The next big change in Snipes's composting operation was his switch to more efficient equipment to improve the quality of his compost, and reduce costs. To do this he switched to a tractor pulled compost turner. In his search for a high-quality compost turner Snipes found Midwest Bio Systems and the Aeromaster compost turner. “I got a good, comfortable, feeling as I talked to the folks at Midwest Bio Systems. I liked the design of the Turner. I liked the paddles as opposed to having the flails. I liked the way it seemed to lift the material without cutting and chopping it.” This efficiency that drew Snipes to the Aeromaster brought immediate results to his program. These turners work by thoroughly mixing and aerating all the material in compost windrows, evenly blending and mixing every particle, adding oxygen and moisture, all of which contributes to a clean, efficient decomposition process. “We purchased our (Aeromaster) windrow turner in 2011 and we started seeing immediate improvements in that we were turning out a better product immediately. The mix was just homogenous and the temperatures were constant throughout the entire windrow,” Snipes said, in contrast to the loader. 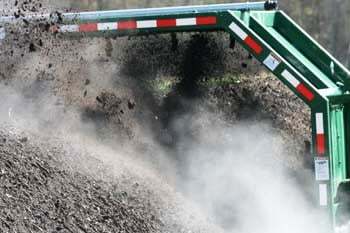 The more homogenous particle size means that this compost can be spread with a manure or litter spreader without the need for screening, he explained. Creating a high quality product allows the landfill to sell their compost at a competitive price to individuals as well as local farmers who are using it in their crop fertility programs. “We sell a lot cheaper than you should, but we sell it because it benefits people in the community and it benefits the landfill because we are saving that space,” Snipes explained. 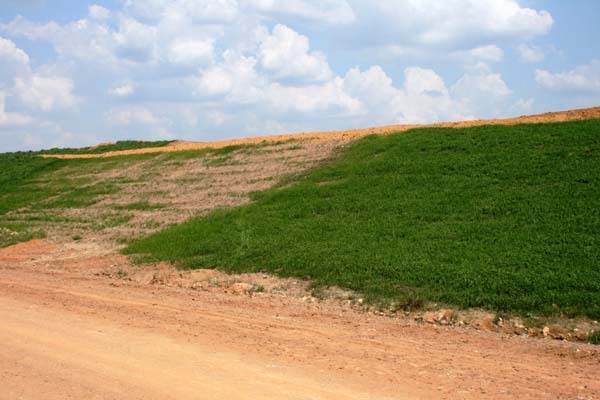 Snipes also utilizes the compost extensively for erosion control and as a fertilizer at the landfill. “We have ceased to purchase commercial fertilizer and we have not bought any commercial fertilizer at all since 2011.” Not only has this cut out an expense for Snipes, but the grass is actually growing better with compost as a fertilizer. “We’re actually seeing more vigorous growth in the slopes dressed with compost as opposed to the slopes that we were using topsoil on and chemical fertilizer,” he said. Compared to the loader, the compost turner has also reduced the costs of Snipes' composting operation. Where it once took eight hours of working time to turn all of the landfill's compost windrows with a loader, Snipes reports that now they can turn the same amount of material, in one hour with an Aeromaster compost turner. “So we have significant fuel savings, significant labor savings, and obviously it's less wear and tear on equipment. It allows us to do some other things, and to do a better job, and it really gives us that extra time to keep the site much more neat than it would be if you were out there constantly turning with a loader,” he said. The compost turner has also meant that Snipes no longer has problems with the loader tires tearing up his clay compost pad which is built on top of the active landfill. Indeed, from increasing the lifespan of the Laurens County Landfill, to offering environmentally and economically efficient options for the citizens of Laurens County, composting on the landfill has been a success. How much of a success? Snipes said that his facility composts some 2,000 tons of biosolids each year, as well as 4 to 5,000 tons of yard waste, 75 tons of animal mortalities, and food waste, and all of this with no odor issues, whatsoever. “We have been able to manage our material with no odor issues, at all,” he reports.